Despite the myriad spellings, heights and pronunciation's you will come across, the fact remains that Ireland's highest mountain offers a rich variety of both walking and climbing all year round. From walking routes suitable for hillwalking novices and those looking for a 'one-off' ascent to difficult challenging climbs on rock (and ice when the weather allows!) there is something here for everyone. This is a mountain not to be underestimated. 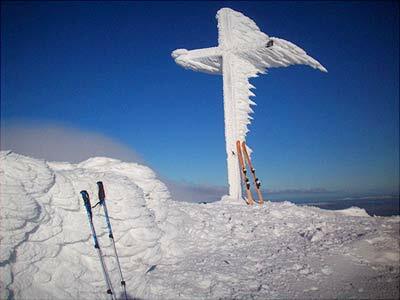 A guided trip will greatly enhance your safety and enjoyment of your day on Ireland's finest peak. 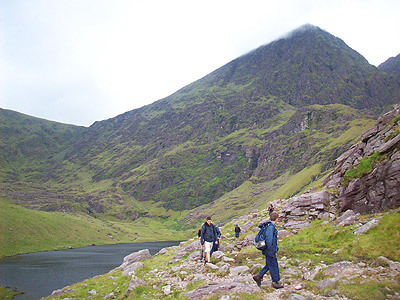 Those seeking to simply meet the challenge of climbing Ireland’s highest peak can choose between the most popular routes going via the “Devils Ladder” or “Br O’Sheas Gully”. Hillwalkers with more experience or fitness will probably find more satisfaction in completing a traverse between the first and second highest mountains we by tackling the Beenkeeragh Ridge, a route that takes an easy scramble along an exposed edge. For a truly magnificent day out the Coomloughra Horseshoe gives a long but rewarding day. As a final suggestion for walkers we would recommend an ascent from the West Ridge of Caher. This is the remotest aspect of the mountain and the route although slightly longer is probably the finest walking route to the top. It is rarely crowded, and offers views over the Black and Bridia Valleys, the western Iveragh peninsula , and an endless panorama of mountains, lakes and sea throughout your ascent. Guided ascents from €200 for groups of 6-10 people. For smaller or larger groups please get in touch to discuss costs and arrangements. This is the home of what many regard to be Ireland's finest mountain scramble - Howling Ridge. 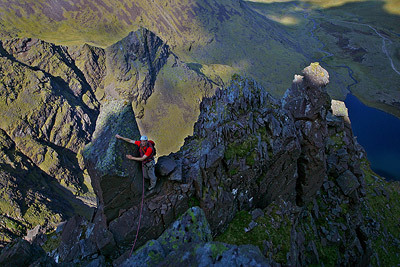 This route climbs a series of pinnacles and rock ribs directly to the summit. While never hugely difficult it offers tremendous exposure and is guaranteed to o=increase the heartrate of those seeking a challenge! Guided ascents of Howling Ridgefor €175 for 2 people. For larger groups please get in touch to discuss the possibilities Those who have already climbed Howling Ridge or those simply looking for an even greater challenge needn't go too far. Just a few hundred metres away is 'Primroses Ridge'. An ascent of this route is moving away from scrambling and very definitely into the realm of mountain rockclimbing. Guided ascents of 'Primroses Ridge' is limited to 2 climbers per guide and requires some previous experience of scrambling or climbing. Please get in contact to discuss this if you are interested in a truly memorable climb of Corrantuathail. Price: €200 for 2 climbers.